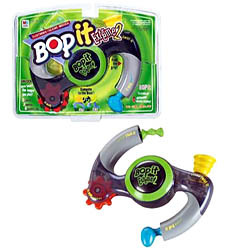 The popular Bop It now with 5 actions and a one-on-one game: Bop it. Twist it. Pull it. Spin it. Flick it. Compete to the beat as spoken and musical commands test your refexes. Connects to your stereo or headphones.